Airpark is starting to get noticed. Check out our day on Karlene Pettit’s Flight to Success! Thank You Karlene! Great Blog to bookmark too! Also, application has been made for the show to be carried by Blip.tv as a webseries. 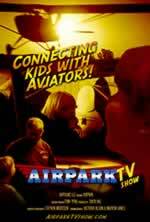 Search Itunes store for Airpark TV Show. The ad is scheduled to run on June 7 and June 21 in General Aviation Magazine. We are in discussions with people from EAA to coordinate both production and hopefully promotional collaboration. 5/24/2013 Crowdfunding sites scheduled to start on June 1st. We are running an an in General Aviation News to coincide with the crowdfunding launch. We will be running at least 2 issues and hope to re-up for another 2. We hope to reach crowdfunders, and future potential sponsors within the Aviation industry. 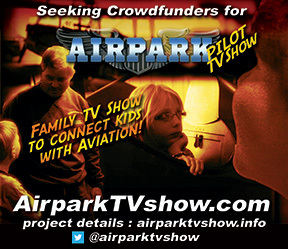 We have both and Indi-Gogo site and Kickstarter and the URL airparkTVshow.com will be pointed to whichever site is live. Currently, Amazon Payments is having trouble understanding why a business would not have any mail sent to it’s physical address. More likely than not, we will launch with the indie-gogo site which offers partial funding if the full goal isn’t met. This would allow to at least shoot some segments vs the all or nothing scenario with kickstarter. I am currently seeking top notch, on the ball production types to help in the coordination of the pilot. Please get in touch if you have what it takes to work in production.